Funeral services for former Memphis Grizzlies owner Michael Heisley are set to be held on Thursday, May 1. Heisley passed away in Illinois at the age of 77 on April 26. The Heisley family is inviting friends and well-wishers to wake held from 2-8 p.m. at Malone Funeral Home (324 East State Street, Geneva, Ill., 60134) on Thursday. Funeral Mass services are set to be held at St. Patrick Catholic Church (6N491 Crane Road, St. Charles, Ill., 60175) on Friday, May 2 beginning at 10:30 a.m. Friends and basketball fans wishing to send condolences to the family may do so by mailing Mrs. Agnes M. Heisley (4N844 Burr Road, St. Charles, Ill., 60175). 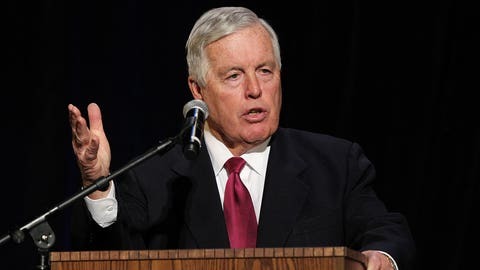 Heisley’s name is most commonly associated with the relocation of the Grizzlies organization from Vancouver to Memphis following his purchase of the team in 2000, a move which went hand-in-hand with the construction of the FedExForum. An active member in the Memphis community, Heisley continued to support the franchise after selling it to current owner Robert Pera in 2012. "I am confident that the franchise will continue its development toward being a perennial championship contender and an important member of the Memphis community," Heisley said following the sale. The Grizzlies will announce plans to honor Heisley at a later date.